Para ver este sitio web en Español, clic AQUI. How does the ¡Más Fresco! More Fresh Program work? The ¡Más Fresco! More Fresh Program, also known as the Southern California Nutrition Incentive Program, is a partnership between the United States Department of Agriculture (USDA), University of California, San Diego Center for Community Health, and Northgate González Market. The primary goal of this research program is to evaluate the effect of financial incentives on the purchase and consumption of fruits and vegetables among CalFresh participants. This program provides financial incentives to CalFresh participants when they purchase qualifying fresh fruits and vegetables with CalFresh benefits on their Electronic Benefit Transfer (EBT) card. These incentive dollars can then be used to purchase additional qualifying fresh produce, which helps to increase the purchasing power and consumption of fruits and vegetables among CalFresh participants. CalFresh participants who enroll in the ¡Más Fresco! More Fresh Program will earn one dollar for each dollar of qualifying fresh fruits and vegetables they purchase with their CalFresh benefits at participating Northgate González Markets. Program participants will be randomly assigned to earn up to $10 per month, $20 per month, or $40 per month for the duration of the program to spend on additional qualifying fruits and vegetables. In addition to providing financial incentives, the program includes ongoing fruit and vegetable discount pricing promotions. In-store nutrition education will also be provided, including healthy food shelf-labeling, cooking classes, and store tours to increase healthy eating knowledge and self-efficacy among CalFresh participants. Program participants will also be asked to complete surveys to evaluate the impact of the financial incentives on the purchase of fruits and vegetables as well as the impact on the overall nutrition of participating households. When do program participants start receiving the financial incentive rebates? In order to start receiving the financial incentive, program participants need to complete an online survey upon enrollment in the program. Once the survey is complete they will be randomly assigned to one of three incentive groups, either $10/month, $20/month, or $40/month. They will then be notified of their group assignment and the specific date when they can start earning the financial incentive rebate dollars. How do program participants earn the financial incentive rebate dollars? Each CalFresh participant who enrolls in the program will receive a special Northgate González Market customer card which identifies them as being enrolled in the Southern California Nutrition Incentive Program. 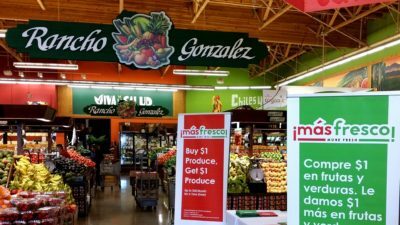 In order to receive their financial incentive, they will need to present their special Northgate González Market customer card to the cashier at participating locations and then pay for the purchase using the CalFresh benefits on their EBT card. 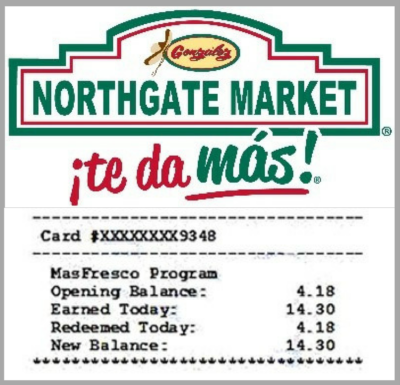 Program participants can only earn the financial incentive rebates if they present their special Northgate González Market customer card to the cashier at the check-out register AND pay for the qualifying fresh fruits and vegetables with the CalFresh benefits on their EBT card. If they pay for the qualifying fresh fruits and vegetables with a check, cash, credit card, or form of payment other than CalFresh benefits on their EBT card, they will not earn the financial incentive rebate. To watch a video or learn How to Earn and Redeem ¡Más Fresco! More Fresh Dollar click HERE. Why is it important that program participants use their special Northgate González Market customer card when they make their purchases? How do CalFresh participants enroll in the program? 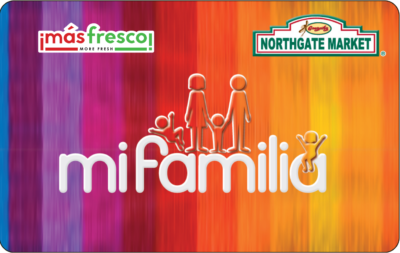 CalFresh participants can enroll in the program at special enrollment events that will take place at participating Northgate González Market locations. The enrollment events will be advertised, promoted and shared with CalFresh participants in a variety of ways. The Southern California Nutrition Incentive Program will have ongoing 12 month enrollment periods starting in the fourth quarter of 2016, and continuing through 2020. What is the maximum amount program participants can earn each month? CalFresh participants who enroll in the program can earn up to $10, $20 or $40 in financial incentive rebates per month depending on which group they are randomly assigned to. How will program participants know they are earning the financial incentive? The store receipt that program participants receive when they shop at the participating Northgate Gonzláez Markets will show the financial incentive rebate dollars they have earned by purchasing qualifying fresh fruits and vegetables, which they can then use to purchase additional qualifying fresh fruits and vegetables. \What are the qualifying fresh fruits and vegetables? any brand, type, or combination of fresh fruits and vegetables, including organic fresh fruits and vegetables. The list of the qualifying fresh fruits and vegetables is included in the enrollment packet that program participants receive when they enroll in the program. What is the procedure if a program participant returns a qualifying fresh fruit and vegetable that they previously purchased with their financial incentive dollars? If a participant in the ¡Más Fresco! More Fresh Program wishes to return a fresh fruit or vegetable item that they purchased with the financial incentive dollars they previously earned, they will be able to return the item for a like or similar item. Can program participants buy foods other than fresh fruits and vegetables with their earned financial incentive dollars? A key goal of the ¡Más Fresco! More Fresh Program is to help increase the purchase and consumption of fruits and vegetables for better health among CalFresh participants. As such, the financial incentive rebate dollars that program participants earn are only for the purchase of qualifying fresh fruits and vegetables. Where can program participants shop to earn the financial incentive? If program participants have questions about the program who should they contact?